I’m writing this post because I really, really want this camera! Halloween has never really been “celebrated” at our house. We were allowed to dress up as long as we weren’t anything scary/evil. Sometimes we went Trick or Treating but most years we didn’t. Sometimes we carved pumpkins, sometimes we didn’t. My favorite part of Halloween is the costumes. I loved dressing up. Still do (although I haven’t in years). When Halloween would come around mom would take my sister and me to JoAnn Fabrics to look inside the big costume books. We would get an idea of what we wanted to be and then mom would put it together with what we had at home. Unfortunately I don’t have many photos of my costumes. We used a lot of items from home, so whenever possible I tried to use a photo of some of the items even if I’m not in full costume. Here are the few memories that I have of my Halloween’s past. I was too little to remember anything about this. 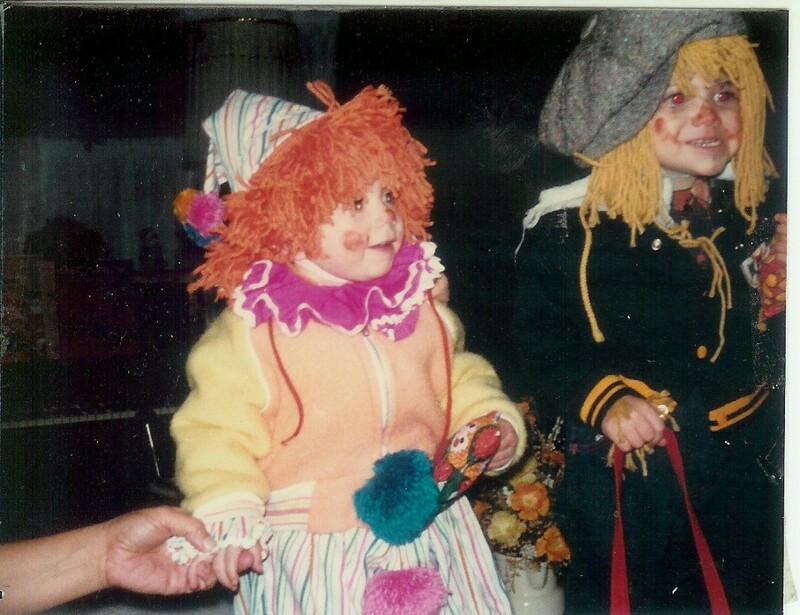 I think this was my first time ever going Trick or Treating. I was just over two and my sister was just shy of one. I was a scarecrow, my sister was a clown, and my cousin was a cheerleader. Because I couldn’t find any pictures from these years and I was still so young, I have no idea what my costume was. One of these years (I think that it was 1983) we had moved to FL. I seem to remember my sister and I Trick or Treating with our dad who somehow lost his keys in the grass. It was dark outside and he had a hard time finding them. I found the keys. My dad started calling me “Hawkeye”. Little did he know that only 3 years later I would need glasses and now I can only see an inch in front of my face! I actually have no memory of this Halloween at all. From the picture I can tell you that I was a bunny and my sister was a lion. I can also see that this was a church Halloween party. For being a children’s party at church, there are some pretty creepy looking costumes in the background. (Top photo from left to right) I can’t tell if that’s a giant hat or if the person has a sack over their head. Is that a green-faced bearded lady wearing rubber kitchen gloves and holding a broom? That is actually a Care Bear, but it’s still scary. This clown is way more creepy than fun (ditto for the mini clown in front). I was in first grade this year. We had a Halloween parade at school. As best I can remember it, each classroom was designated a time when they would walk through the whole school in each classroom (I could be remembering incorrectly…it might’ve just been the other classrooms in your grade). I was a gypsy. I loved my costume. My grandmother had this full, puffy, white slip with red stars all over it (pictured below while playing dress up, not in costume). My mom tied it around me (because it was too big) and I wore some sort of top over it with a brightly colored shawl. Then she tied a scarf onto my head. It was the 80s and my mom had all kinds of big, tacky jewelry. I put on beads and necklaces, some jewelry on my head, lots and lots of bracelets, rings, some ankle bracelets, and I think we even put some big jangley necklaces around my waist. My mom put a lot of heavy make up on me. For shoes I went barefoot because aren’t gypsies always barefoot? (I really don’t know) Since I would be in my classroom being barefoot wasn’t a big deal…but then there was the parade. I walked all over the school in my bare feet. Yuck! I didn’t step on anything or hurt myself, but just the idea of it grossed me out. 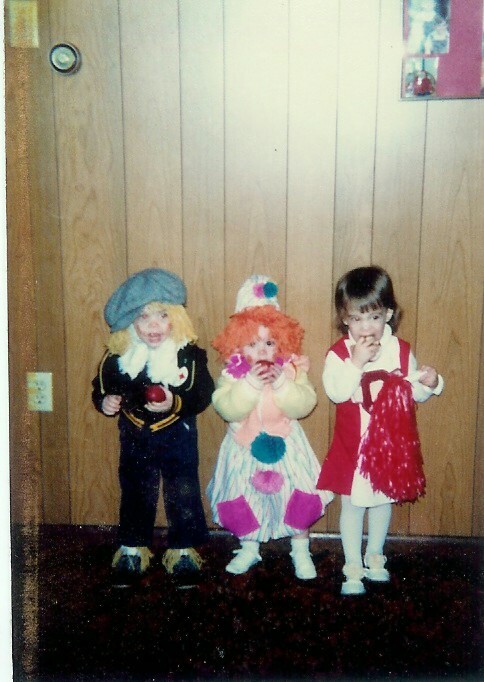 My sister and I went Trick or Treating that year with a friend of mine and our moms (Don’t worry, I wore shoes!). While we were out we had a spooky encounter, you can read all about it in “A Ghostly Tale”. I don’t remember anything specific about this year other than the costume. I wore my bathing suit with tights underneath it, leg warmers, and tennis shoes. I had my hair in a pony tail and wore a head band and wrist band. I wore a sweatshirt over the bathing suit, which I believe had the neck cut out so that it would hang off the shoulder. I seem to remember the bathing suit having white and purple vertical stripes and having a white fabric belt with plastic buckle attached to it. Maybe a little too cold for Trick or Treating, but definitely a cheap and easy costume. 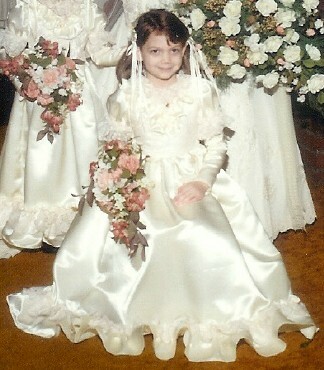 I wore my beautiful flower girl dress from my aunt’s wedding. A picture of me in the dress at the wedding can be seen below. We bought a scepter at the store. It was almost as tall as me. It was plastic with a red handle and a white star at the top. You could put batteries in it and the star would light up. I hated the red handle so my mom wrapped ribbon all around it and put glitter on the star so that it would shine when it was turned on. I don’t remember anything else about the costume, like what I did with my hair or wore on my head. I think I might’ve been a fairy princess…which means I would’ve had wings. For whatever reason, the scepter is what I remember the most. 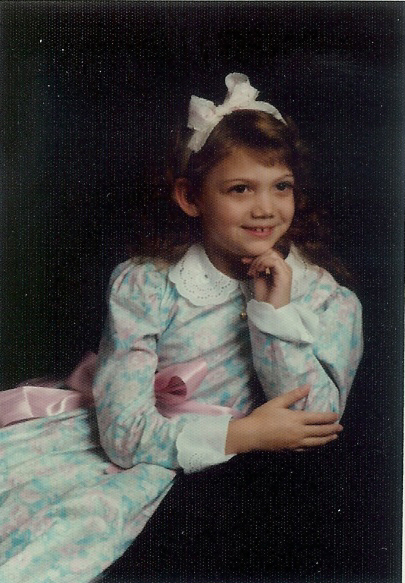 I wore my Easter dress from the year before (Easter photo shown below). It always reminded me of Little Bo Peep. We added a poufy crinoline underneath it and I think I might’ve had some pantaloons peeking out down by my ankles. I think we may have tied a bigger, more exaggerated sash/bow around my waist. We put my hair in big baloney curls with a big huge bow. We took the princess wand from the year before and wrapped pink satin ribbon around it. For the crook we removed the star and put a wire coat hanger in there which we bent into a crook and taped to the handle. We then put an empty paper towel roll over the wire crook and wrapped it in ribbon. We tied a big pink satin bow underneath the crook. I carried a stuffed lamb with me which was actually a gift from the Easter Bunny in 1982. This year there was a party at the church in the parsonage basement. I remember getting a Polaroid picture taken that night, which I had for years…but can’t seem to find it now 😦 This year I was in Middle School, so no Halloween Parade. Instead there was a costume judging contest. I believe the judging went by grade. You would go to the auditorium and were put in like groups. They kept narrowing down each group until they had the top 3 (5?) costumes in that grade. I believe I was always in one of the top-ish groups. I seem to remember this kid Kevin winning every year. He had some pretty good costumes. For the Southern Belle costume I used a dress that had belonged to my mom as a child. I think that one of her grandmothers had made it for some sort of patriotic holiday. It was blue with little (red?) flowers on it and had a matching bonnet. To make the skirt full my mom took a hula hoop and sewed it to the bottom of the skirt using small pieces of elastic. I had big baloney curls in my hair once again. Since I was a “winter” southern belle I also had a white faux fur muff that I wore. I once again was close to being a finalist in the costume contest, but didn’t win. This year we bought my Cleopatra costume from the store. I don’t remember wearing a wig, but at the time my hair had a similar cut (although it was blonde, so…). In addition to what the costume came with we added more heavy gold jewelry around my neck. Slap bracelets were popular then and I had to shiny gold ones that I wore on each wrist like cuffs. The costume had a stretchy gold headband with a cobra attached to it, and I did wear it, but we fashioned one of my mom’s gold necklaces around it to make it look more authentic (and not so cheap). We had a gold snake to wrap around my upper arm. I wore sandals and heavy eye makeup. One thing that I remember most about this costume was that it had a big leg slit. Every time I sat down my skirt flew open and my one entire leg (clear up to my upper thigh) would be showing. I had to keep closing my skirt all day. For some reason I decided that I want to be a Kleenex box. I didn’t win a prize again, but I came close. Everyone loved my costume. I’m not going to give anymore details right now, because I’ll be writing more about this tomorrow! I was so certain that this Kleenex box was a winner that I decided to try it again this year! I was actually a finalist! I think I got 3rd place. Because of the design of the costume, I couldn’t sit in my desk at school. So I “sat” at the front of the class during homeroom. I was holding a real box of Kleenex and the other kids had fun coming up during class and getting Kleenex’s from me. This was a really difficult costume to Trick or Treat in because it was so hard to walk up and down the stairs. I was a freshman in high school in 1993. Although I believe that you were allowed to come to school in costume, no one really did. There weren’t any Halloween parties or parades or costume contests, so there was no need to have a costume specifically for school. This year my sister and her friend Julie decided that they would go Trick or Treating. This was the first year that we would ever be going alone. I borrowed Julie’s sock hop outfit. We went Trick or Treating but I didn’t walk up to any doors or take any candy. I felt really stupid and too old. I was 14. That was my last time Trick or Treating. 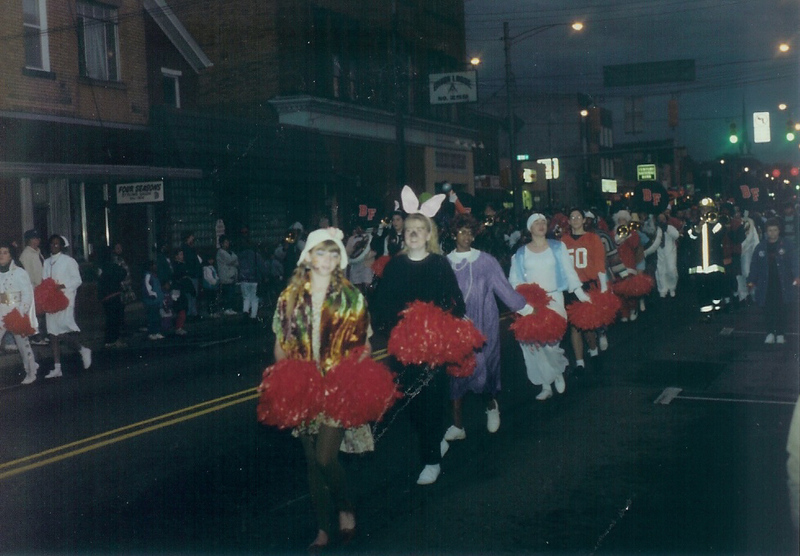 This year I joined the school’s Dance Line which performed with the marching band in the neighboring city’s Halloween Parade. Baby doll dresses were back in style at this time, so I started with that and some leggings for my costume. I added a tie-dye “shawl” that I found in our attic (I think it was a table runner). I put my hair in braids and added a floppy hat and peace sign necklace. 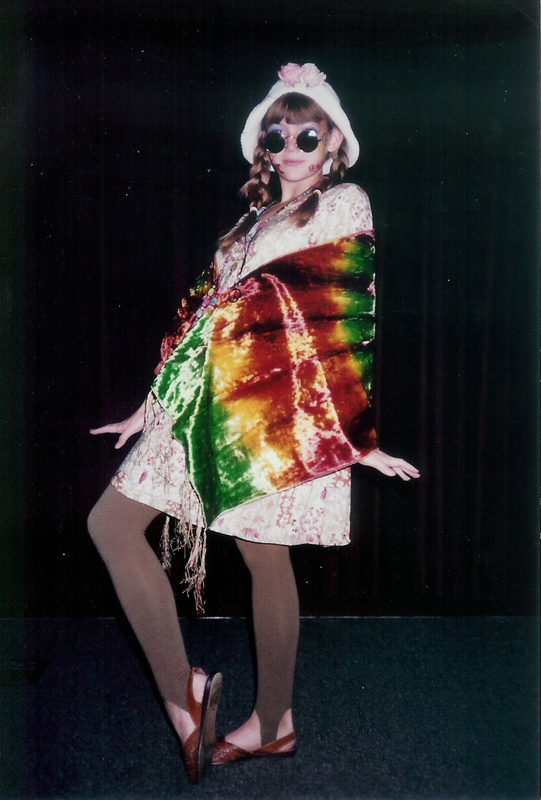 I finished off the outfit with some flower power on my face and a pair of “John Lennon” sunglasses (also popular in the 90s). 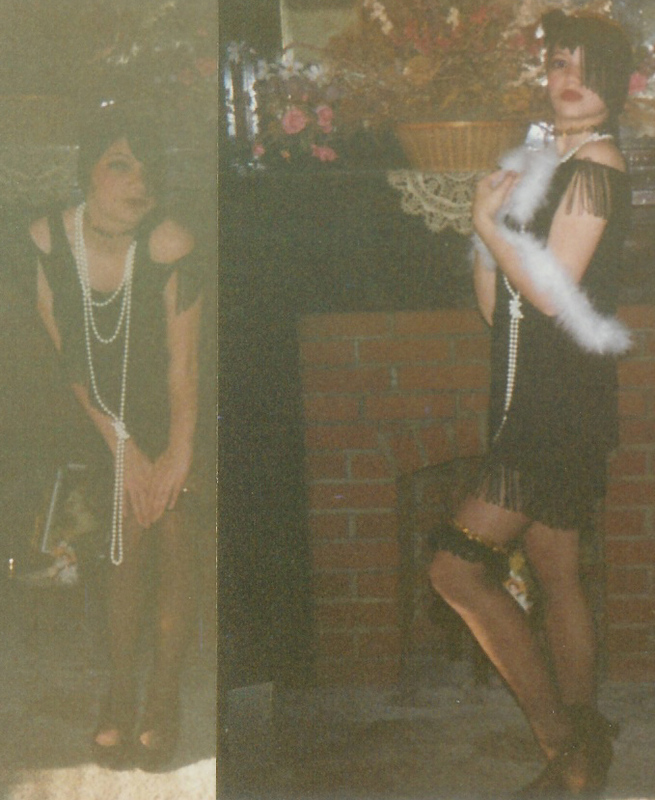 This year I wore a flapper costume to the Halloween Parade. The below photo is actually from a talent show about 5 months before Halloween, but it’s the same thing that I wore except for the shoes. I wore black jazz shoes instead. 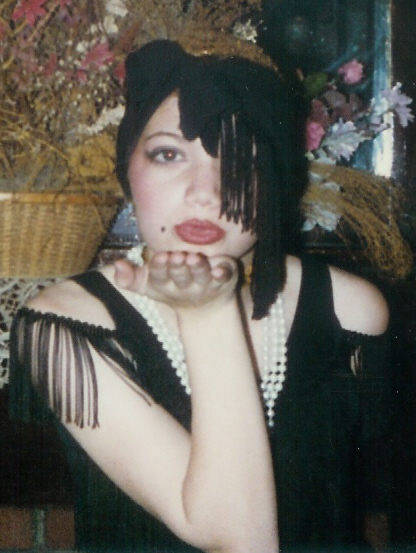 The costume began as a long black dress with spaghetti straps that I had been given as a hand-me-down. The material was that stretchy, wrinkled kind and the dress was way too long for me (I tripped in it). We cut the bottom of the dress off and then my mom took rows of black fringe and sewed them around the dress and added some to the shoulders. She took some of the cut off material from the skirt and tied it into a headband/bow and then attached more fringe. The gold sequin cap, choker, and garter were all part of an old ballet costume from years before. We attached fringe to the garter and removed the giant blue feathers from the cap. My mom already had the pearls. I added a boa and black hosiery (which had seams up the back, but you can’t tell in the photos). Finish off the look with dramatic make up and spit curls (not visible in the photo). 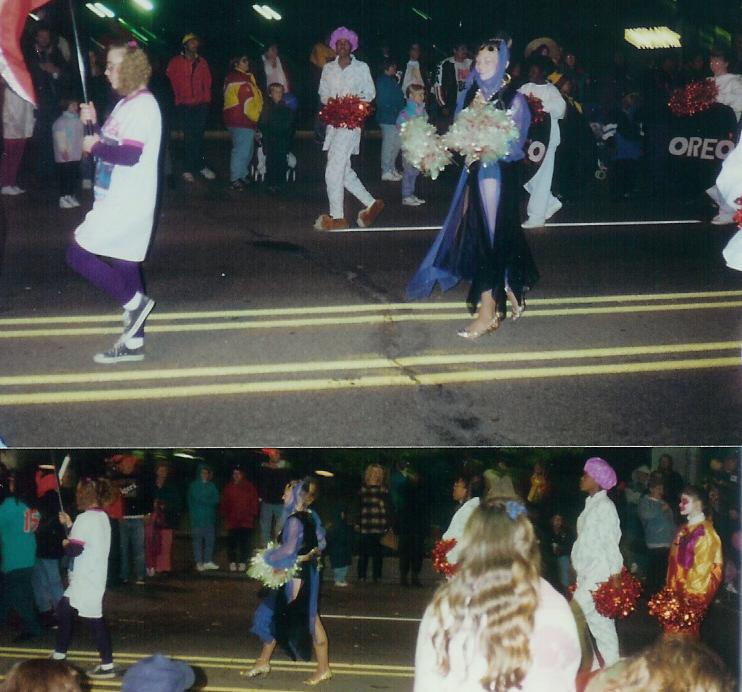 In 1996 I was a senior in high school and this would be my last Halloween parade. We bought the genie costume at the store, but embellished it with my mom’s jewelry. Everything hanging off of the hat, the top, and the waist are my mom’s jewelry with added bracelets and arm cuff. You can’t really tell in the picture but I also have a tiny genie lamp hanging from my waist. We took plain white shoes and added gold glitter and sequin. You can’t see it in the photo, but we also painted a genie onto my calf. During the parade some kid came running up to me and handed me an envelope (which I thought was weird). Later on when I got to open it I found out I had one a $5 prize for a good costume. I never bothered to redeem it. So there you have it, all of my memories of Halloweens past. If you would like to read more stories about my childhood you can find links to my “Piggy Tales” below where I recorded my youth and young adult years in 20 posts. *My Birth Story – I’m always late! Posted on October 30, 2010, in Fall, Flashbacks, Halloween, Holidays, Traditions and tagged costumes, fall, flashbacks, Halloween, photos, tradition. Bookmark the permalink. 7 Comments. What a great post! I love all the pics of Halloween past! The Genie is awesome and the shots where you’re a little one are priceless! Thanks 🙂 I wish that I had photos of all of the costumes. My mom had a great knack for pulling together something authentic looking with things that we already had and minimal/no sewing. The Genie was one of my favorites but in hindsight I would’ve attempted to make it a little more modest. LOL, 3 Ninja’s DOES rock! I actually thought of that when I was writing this. Anyway, I had written “my sister and I” but the proof reading thing kept correcting it, so I thought maybe I was wrong and I changed it. Oh well. I love all the great pictures!! This is a great post as all of your flashbacks are! Thanks, Retha! I enjoyed your trip down memory lane as well. I love reading about other people’s lives and memories and seeing old photos 🙂 I wish I had more Halloween pics, though. That’s awesome that you have so many pictures of your costumes through the years.